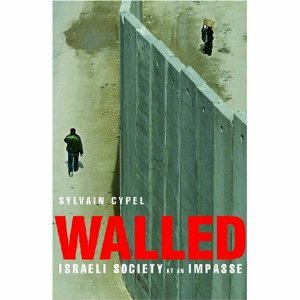 Walled: Israeli Society at an Impasse, by Sylvain Cypel is a far-leftist account of Israel and its history, written from an anti-Zionist perspective which was forged by a then Maoist/Trotskyist activist in the mid-1970s. These leftist historians and journalists conveniently forget their prior commitment to "narratives" and that "knowledge/truth is power" when talking about Benny Morris's new positions on Zionism and Israel. It all boils down to racism, or "ethnicism" (a favourite of Sylvain Cypel), or "Orientalism" — which are all virtual-synonyms to these academics. Because they are all far-leftists, whether Trotskyist or Communist, it's all a matter of racism. That's because racism, to them, is strongly tied in with capitalist imperialism or colonialism. That is, racism, or ethnicism, or Orientalism, is what "rationalises the imperialist or colonialist crimes" in the eyes of the criminals themselves. In "order to legitimise the colonialist or imperialist actions", one has to "dehumanise the colonised". You do that through racism (or, say, "Islamophobia"). The anti-Orientalists must assume that all value-judgments about the colonised  even if they are colonised (which isn't the case in the Israeli-Palestinian situation) — simply must be wrong. No culture can be inferior to any other culture. That is the pure relativist position. Except that, being leftists, their relativism isn't that pure. These very same people who talk about "Orientalism" and the rest are thoroughly against "Western" or "capitalist" culture and civilisation — and it is that which drives them. It's even the case that they often prefer Arabic, or Islamic, or African, or head-hunter, culture to their own. (To Western "capitalist and imperialist culture".) Thus we can say that they are, in fact, Occidentalists  they are anti-Western. But we don't need to say this. I will keep their word  "Orientalist". They are racist, and therefore Orientalist, precisely because they almost always see Arabic, or Muslim, or African, culture to be superior to the West. That is the Orientalism of those who are over-positive or over-generous about other cultures. It is a form of inverted-racism. Not even that. It is pure racism. There are some thinkers and theorists, for example some post-structuralists (those that practice deconstruction, such as Derrida), or some post-modernists (such as like Jean Baudrillard), who don't entirely fall into this trap. However, most people who speak in defence of, say, Islam or the Arabs, do so because of their distaste for "Western capitalism and imperialism". They are far from being relativists when it comes to Arab or Islamic culture. They are defending such things against the crimes and evils of the West. Sylvain Cypel quotes many "Orientalist" passages from Benny Morris. However, despite the many quotes, he never once argues as to why such views are wrong. He simply assumes that they must be wrong. No Westerner, or Israeli, ever has the right to pass judgement on another culture or religion  least of all Islam or Arabic culture. It is simply not on. And it isn't acceptable, in any form, because of Cypel's pre-existing leftist position on these things. Criticism of another culture simply must be seen as a disguise for racism, or ethnicism, or Orientalism. They are simply tools of the capitalist, or colonialist, or imperialist, used to "justify or rationalise the oppression of the colonised peoples". Thus every value-judgement (say, against head-hunters or Palestinians), no matter how profound or well-argued, must simply be "a disguise for racism"  which itself is an "ideological" tool used for capitalist exploitation (in the form of colonialism or imperialism). Cypel is a child of the 1960s and 70s. He was a member of Israeli revolutionary anti-Zionist group Matzpen. In 1970 he split away from Matzpen and established the Workers' League, commonly known as Avangard. But you can't always hold people guilty for past misdemeanours. They may have changed. However, the problem is that it was at this time that Cypel forged his anti-Zionist position or stance. He has been thoroughly infected with the prejudices and ideological clichés of the revolutionary left. Even if he's not an active revolutionary today (he doesn't need to be  he and his friends control the institutions  Gramsci-style), his position was born and nourished at that time. Today he has simply finessed it and made it a little less crude.